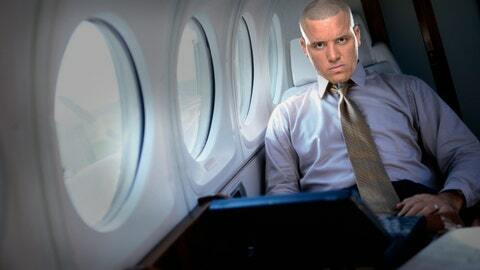 Pat Barry no like flying. Pat Barry does not like airplanes. So much so that a quick ride from New York to New Jersey would be enough for him to object to. Flying from California to Australia? Torture. But for the UFC heavyweight, his 14-hour flight to the destination of his upcoming UFC Fight Night match with Soa Palelei was made even more unbearable by the person seated next to him. As fate had it, he was placed alongside a 19-year-old Mormon who was traveling to Tonga to begin a two-year mission. Apparently, the young man decided he should begin immediately by trying to convert a professional fighter. "He wanted to know when was the last time I went to church, how come, why was it so long ago, and then the question that started everything off: When did you just give up on Jesus?," Barry recounted. "I figured he’s a Mormon, he’s 19, he hasn’t had much life experience, I figured [I’d say], "As soon as my husband told me I should stop. " He said, "Really? " and I was like, "Yeah, that’s what it was," said Barry, who does not object to organized religion but does not personally embrace it, either. The conversation went on for a while, the two going back and forth, before apparently agreeing to disagree. Barry is not an atheist, he said, but that he’s "on whoever’s side that’s winning." Somewhere along the way, the young man realized that Barry was a professional fighter, and either that or Barry’s resistance warded him off for the rest of the flight, finally giving Barry a bit of peace. "By the time we landed, he didn’t really talk to me that much anymore," Barry said. On Saturday, Barry squares off with Palelei, who recently made a successful return to the UFC with a much-maligned victory, a third-round TKO. However, at the time it wasn’t known that Palelei was competing with broken ribs. Barry said that context greatly changes Palelei’s final grade for that match, and sees him as dangerous everywhere. Coming off a loss to Shawn Jordan, Barry is aiming to develop some newfound consistency, and says his next modest goal is to win back-to-back fights. That and avoiding long plane trips. "I got here and called [girlfriend] Rose [Namajunas] and told her everything’s fine. But now we live in Australia because I can’t go back. I can’t go home," he said. "No more airplanes."